The mini-boom is coming to an end. Yet the Swiss economy continues to grow robustly. The Swiss economy is experiencing a "mini-boom." This is due to a perfect combination of various factors that is very unlikely to be repeated in 2019. Several indicators point to economic growth of less than two percent. This year, Swiss GDP is expected to increase by 2.7 percent. In contrast, for 2019, Credit Suisse economists are forecasting economic growth of 1.7 percent. At first glance, this seems meager. However, 2018 is an exceptional year. It is becoming apparent that next year will be weaker. Exports are a key driver of the Swiss economy. The prospects for the export sector currently do not look as favorable as they did in the past two years. 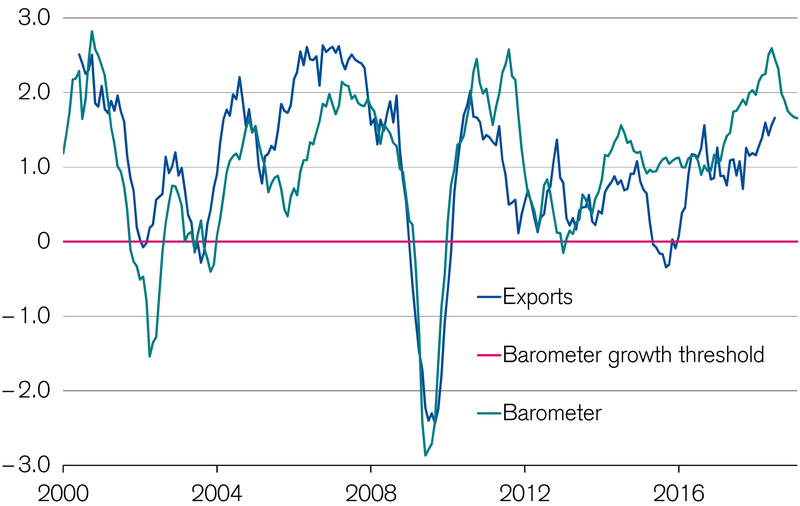 The export barometer has recently gone down significantly. This barometer measures the potential demand for Swiss goods abroad. 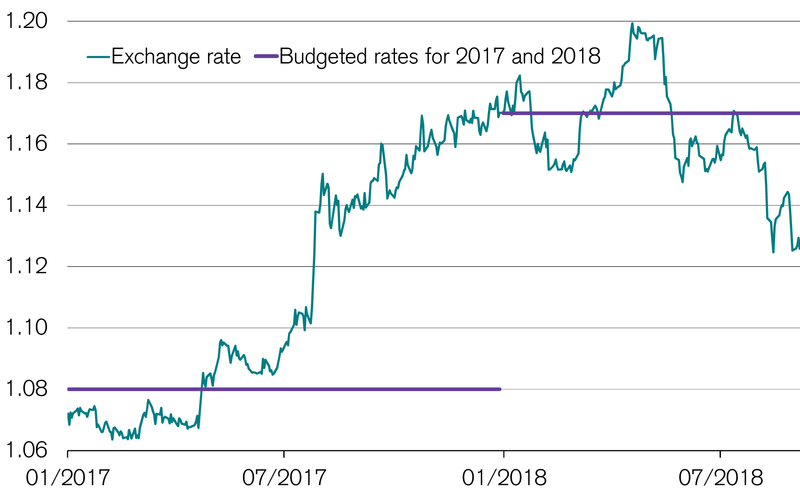 The expectations for the EUR/CHF exchange rate are also different now than in 2017 and 2018. Back then, companies expected a low exchange rate, but were pleasantly surprised by a depreciation of the Swiss franc. As a result, they found the courage to invest. Additionally, the franc depreciation increased the margins and the profits of exporting companies, which in turn created more leeway for the financing of investments. The Swiss economy was able to invest at an above-average rate. In the meantime, the franc appreciated several times. The pleasant surprise became an unpleasant one. This is likely to depress investment sentiment. At the same time, the capacity utilization of the industry that had existed until recently seems to be decreasing. Companies have recently expanded their production to the extent that delivery times shortened once again. At the start of the year, these times were still at record levels – an indicator of a bottleneck that is now over. All in all, exports as well as capital spending on machinery and equipment are likely to remain buoyant in 2019, although they will be weaker than in the current year. The same applies to construction investments. Key factors here include the growing oversupply in the housing market and ever-thinner order books for civil and structural engineering firms alike. 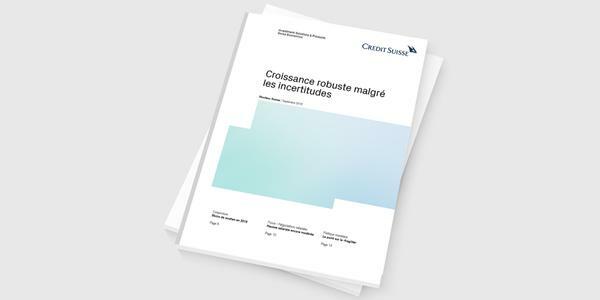 Monitor Switzerland from Credit Suisse provides analyses and forecasts on the Swiss economy. This time, the focus is on salary development. Read why salaries in Switzerland will increase only slightly in the next few years. Another driver of the Swiss economy is private consumption. The latter is likely to remain robust in 2019, but experience only modest growth. The labor market, which has recently improved quickly, acts as a support. 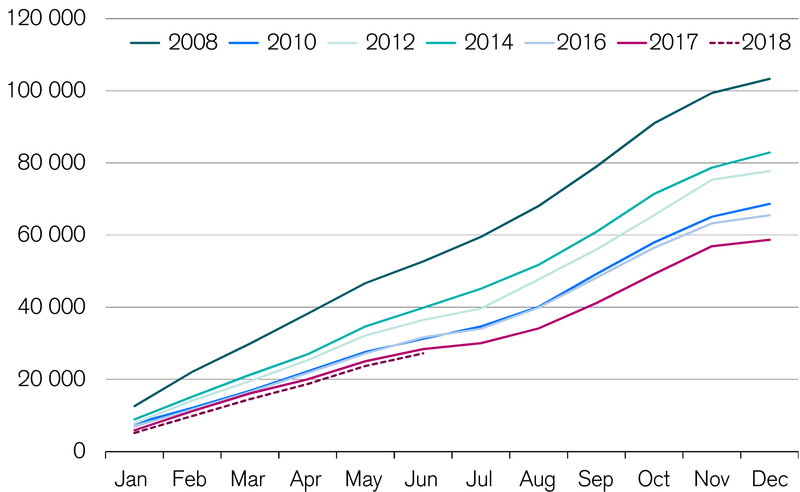 Employment should continue to increase in 2019, and unemployment to decrease. This is generally a solid foundation for robust economic growth. However, real wages are increasing only slightly despite shortages on the labor market. Overall, purchasing power is barely increasing. And the constant flow of crisis reports from abroad is also likely to dampen the consumer mood. Last but not least, immigration has now stabilized at a low level. Additional stimuli from this hitherto most important growth driver can hardly be expected. Switzerland's GDP is broad-based and therefore resistant to a certain extent to global political crises. However, the Swiss economy is not immune – to a collapse of the world economy, for instance. Credit Suisse economists are nonetheless confident: they consider the likelihood of pleasant surprises greater than that of unpleasant ones. Nevertheless, they believe that economic growth in 2019 will not match this year's "mini-boom." At the end of 2017 and in early 2018, there was a perfect combination of driving factors: At the same time, there was extremely dynamic world economic growth, a surprise depreciation of the Swiss franc, low interest rates, and a recovery of the labor market. The icing on the cake was added by large international sports events such as the Olympic Winter Games and the football World Cup. Many sports associations are headquartered in Switzerland and increase the GDP through their income. This will not be the case in 2019. Do you have any questions about Monitor Switzerland or the Swiss economy?